John Piper, the well known pastor, confuses me. Adrian Warnock, who is attending Piper’s current conference, quotes him as saying “Your God is whatever you find most joy in” and “We deserve to go to hell for not preferring God above all things”. Great! But on the same day Piper tweets “My only hope is The Book” – note the capitals. (To be precise, the tweet is from Piper’s ministry, quoting Piper.) Does this mean that the Bible is Piper’s God? Does it mean that he deserves hell for preferring the Bible to God? He certainly doesn’t deserve my respect as a teacher for this kind of heretical teaching. 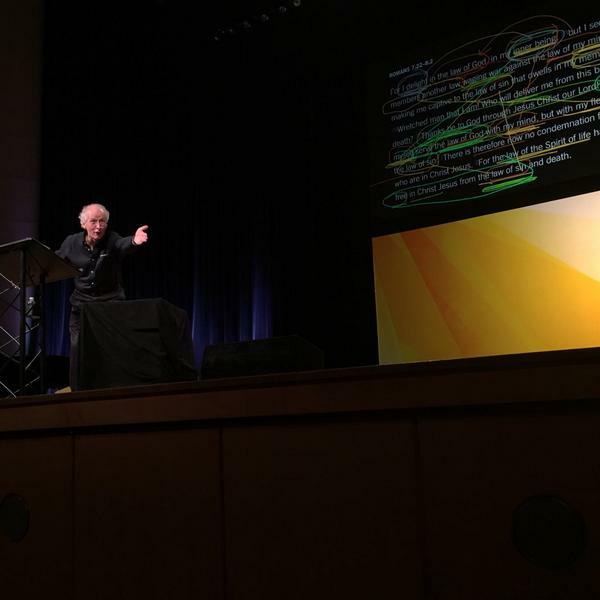 John Piper preaching today – how many feet above contradiction? Sadly this kind of confusion is all too common in more-or-less evangelical churches, where the Bible is treated as God. We read in it that “the Word was God” (John 1:1), but forget that for John the Word or Logos was Jesus Christ, not the Bible. In fact nowhere in the Bible does the word “word” clearly refer to the written Scriptures, although sometimes it does refer to the gospel message or other teaching from God which is written in the Scriptures. So let’s stop thinking and behaving as if the Bible is God. It is a book of words from God, and of words of men inspired by God. (I don’t want to get into a discussion here of exactly what that means.) Yes, we can find our hope in this book, but our hope is not the book, it is the God whose good news for us is written in the book. John Piper, you need to remember this, and preach it. Archdruid Eileen has posted an interesting poem by Thomas Hardy, The Convergence of the Twain. And it seems that this is a genuine poem, not a Beaker Folk satire. According to Wikipedia, it was published in 1915. 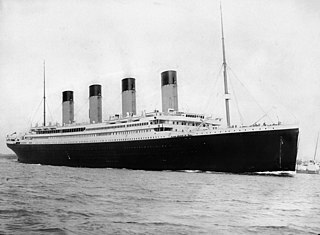 And it is relevant today because it commemorates the sinking of the Titanic, 100 years ago today. What is shocking to read is that Hardy, the 19th century novelist who became a 20th century poet (his last novel was published in 1895 and his first poetry in 1898), clearly blamed God for sinking the Titanic. It is “The Immanent Will that stirs and urges everything” who prepared the iceberg, and when “the Spinner of the Years // Said ‘Now! '” the collision took place. And Hardy seems to imply that this is judgment on “the Pride of Life that planned her”. But we also note that the poem depersonalises the disaster by saying nothing about the horrific loss of life. Now Hardy was well known for his religious scepticism, and leaned towards agnosticism and deism. So it is hardly surprising to see a somewhat jaded image of God in his poem. Why would God reach down his hand and drag his fierce fingers across rural America killing at least 38 people with 90 tornadoes in 12 states, and leaving some small towns with scarcely a building standing, including churches? … God alone has the last say in where and how the wind blows. If a tornado twists at 175 miles an hour and stays on the ground like a massive lawnmower for 50 miles, God gave the command. But is this God who chose, for no fault of their own, 38 people to kill with tornadoes and 1,514 to kill with an iceberg really the Christian God we learn of in the Bible? In his article about the tornadoes Piper quotes verses about God sending winds and others about people being killed by winds and other disasters, but none of these passages say explicitly that God sent the winds or other means which killed people. He quotes Matthew 8:27, but ignores the context in the previous verse: if God sent that particular wind, why did Jesus rebuke it? The language used in such passages hints at demonic activity in that storm on the Sea of Galilee. And if in that storm, why not also in destructive storms and other disasters today? I don’t claim to know what caused these disasters. Perhaps we should put the blame mainly on humans, who took the risk of living in areas known to be prone to tornadoes and of steaming at full speed across a sea known to be studded with icebergs. For some the risk did not pay off. But in the end what matters is not the anyway inevitable death of our mortal bodies, but that through Jesus Christ we have eternal life and the hope of new and glorious resurrection bodies. One of my first major posts on this blog, in June 2006, tackled the controversial question Did God kill Jesus? See also the post which led up to this, “The Father killed the Son”: the offence of the Gospel?, and the follow-up Did God kill Jesus: should I post like this? Recently a leading evangelical pastor and author has declared publicly that “God killed Jesus”–meaning, I suppose, the Father killed Jesus. That’s his way (I assume) of emphasizing the penal substitution theory of the atonement. Personally, I think some “friends of penal substitution” are its worst enemies. In the mind of Caiaphas, the substitution was this: We kill Jesus so the Romans won’t kill us. We substitute Jesus for ourselves. In the mind of God, the substitution was this: I will kill my Son so I don’t have to kill you. God substitutes Jesus for his enemies. I know it sounds harsh to speak of God killing Jesus. Killing so easily connotes sinning and callous cruelty. God never sins. And he is never callous. The reason I say that God killed his own Son is because Isaiah 53 uses this kind of language. Verse 4: “We esteemed him stricken, smitten by God.” God smote him. Verse 6: “The Lord laid on him the iniquity of us all.” Verse 10: “It was the will of the Lord to crush him; he has put him to grief.” God smote him. God crushed him. My first response to this is an exegetical one. If we look at Isaiah 53:4-5, in Piper’s preferred English Standard Version, we read three propositions about the Suffering Servant separated by other material, which we can summarise as follows: “Surely A; yet we esteemed B. But C”. In other words, A is certainly true, and B is our own human estimation of the situation, which should be rejected in favour of C. That is to say, B is a false proposition, or at least inadequate one, according to the text of Isaiah itself. And what is proposition B? That the Servant was “stricken, smitten by God, and afflicted”. Thus the verse Piper quotes to prove that God smote Jesus in fact says the opposite. It is redundant to note that the Hebrew verb translated “smitten”, although sometimes used in the context of homicide, does not actually mean “killed”, but only “hit” or “beaten”. Meanwhile, when the apostle John (11:51) writes that these words of the High Priest were a prophecy, Piper dares to declare that Caiaphas was speaking his own mind, not the mind of God, which Piper claims to know better the prophet does! Men [gender inclusive, surely?] committed the violence against Jesus, not God the Father, and the actual suffering of the atonement was the rejection Jesus suffered by the Father. “My God, my God, why have you forsaken me?” was the moment of atonement. God did not kill Jesus (at least in my version of penal substitution); people did. The Father did not inflict punishment on the unwilling, innocent Son as his victim; the Son volunteered to suffer the Father’s wrath. The Father’s wrath was not physical violence; it was the rupture within the Godhead suffered by both the Son and the Father (in different ways). The atonement was that he (Jesus), who knew no sin, became sin for us…., with the result that the Father had to turn away and forsake him. The penalty for sin is spiritual death; separation from God, not physical death. This presentation of penal substitutionary atonement, with the Son suffering as a volunteer, avoids any suggestion of the split in the Trinity which is implied by Piper’s version. It refutes Steve Chalke’s accusation of “cosmic child abuse”. The focus is no longer on the Father’s wrath but on his love. This seems similar to J.I. Packer’s view of the atonement as “planned by the holy Three in their eternal solidarity of mutual love”. It is also compatible with the Christus Victor model of the atonement, differing from it in perspective more than in content. Most importantly, it is far more biblical than Piper’s caricature. The only major negative point I would make about Olson’s critique of Piper’s position is that Olson follows Piper in focusing too much on personal sin and justification, on what Scot McKnight calls the “soterian gospel”. Thus Olson’s gospel seems a little unbalanced in the way that I described in my post this morning Which Gospel? Justice or Justification? Olson doesn’t seem to have commented on McKnight’s book The King Jesus Gospel . I would be interested to see his response. Godly men stick up for people, not make fun of them. Godly men honor women, not belittle them. Godly men love their gay and lesbian neighbors, not ridicule them. Godly men celebrate femininity, not trash it. Godly men own their sexuality, not flaunt it. Godly men pursue peace, not dismiss it. Godly men rise above violence, not glorify it. Godly men build up the Church, not embarrass it. Godly men imitate Christ—who praised the gentle and the peacemakers, who stood up for the exploited and abused, who showed compassion for the downtrodden, who valued women, and who loved his enemies to the point of death. So, what story do you have about the most effeminate anatomically male worship leader you’ve ever personally witnessed? Stop talking about it and do something. and names three “Executive Elders”, the first of whom is the “Preaching and Vision Pastor” who is none other than Mark Driscoll. The other two, the “Executive Pastor” and the “Mars Hill Network Pastor”, are surely Driscoll’s personal proteges and are very unlikely to turn against him on this matter. But if we can mobilise a tide of public opinion against this kind of bullying, maybe we can persuade leaders whom Driscoll does respect, like John Piper, to have a word with him and rein him in. Piper was a guest preacher at Mars Hill Church last year. But he has not been afraid to rebuke Driscoll publicly before, on a rather trivial matter. Now is the time for Piper to rebuke Driscoll again. I’m not saying this needs to be public. But if it is not, Piper needs to keep an eye on Driscoll to make sure he stays within acceptable bounds. He should also try to obtain what even the macho Mark has been known to offer in the past: a public apology. Rachel is right that we need to do something about this. But in this case the best thing to do about it is to talk and write about it. Thanks to Joel and Scott for the link to Rachel’s post. I predict that complementarians will completely reject the new NIV because of 1 Tim. 2:12, 1 Cor. 11:10, the paragraphing of Eph. 5:21-22, and Romans 16:7. John Piper has already spoken vociferously against the NIV 1984, perhaps to pave the way for a full rejetion of the NIV 2011. – a concern that I share. Even World Magazine, which led the condemnation of NIV Inclusive Language Edition by calling it the “Stealth Bible”, has offered only mild disapproval of the 2011 update. It has been in the news recently that the Southern Baptist Convention adopted a resolution against the NIV 2011 update and calling on its LifeWay bookshops to boycott it. But this was a last minute motion from the floor of the house, not supported by the convention organisers, which was voted on without the case in favour of the update even being presented. I expect that when LifeWay realises the financial implications of withdrawing one of its best selling Bible versions they will quietly ignore the resolution. By contrast, as I reported at Better Bibles Blog, another very conservative group, the Wisconsin Evangelical Lutheran Synod, looks likely to accept the NIV 2011 update. A WELS committee has considered the update very carefully and issued a long and detailed report recommending the Synod to formally accept the it. The only significant strong negative reaction to the NIV 2011 that I have seen has come from Denny Burk. But Suzanne cannot claim to be a prophet about this, as I had already linked to Burk’s initial complaint in my post. Since then he has written quite a lot more, including a paper in JBMW. In this he comes to similar conclusions to mine in that same post, that NIV 2011 has retained most of the gender-related language of TNIV but about 25% of what some people objected to has been revised. Predictably Burk singles out for comment in this JBMW paper 1 Timothy 2:12, which he calls “The Most Contested Verse in the Gender Debate”. He bases his argument on Köstenberger’s highly dubious argument (which I discussed here in 2006) that the disputed Greek word here, authentein, cannot have negative connotations. He then completely ruins his case, in the eyes of scholars rather than of blind followers of “Reformed” heroes, by quoting and relying on an error of fact by Wayne Grudem. Grudem wrote that the TNIV and NIV 2011 rendering “assume authority” is “a highly suspect and novel translation”, when in fact, as Suzanne had shown (originally in 2009) and tried to point out to Burk, it comes straight from Calvin’s commentary, as translated by Pringle in the 19th century – and is clearly less negative in its connotations than “usurp authority” in KJV. one whose testimony has been inexorably shaped by the NIV translation. So it is not surprising that he is attached to the 1984 version of NIV and has strong negative reactions to any changes to it. This kind of conservatism is a natural human reaction to change. But it is not the way of our God who makes all things new. In the USA there is a strong KJV-only movement, which idolises this 400-year-old versions and will accept no Bible. I wonder, does Denny Burk want to lead an NIV-1984-only movement? 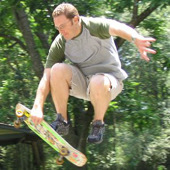 I think he will find this much harder than his skateboarding tricks. Several bloggers, including Henry Neufeld, have linked to a short YouTube video by John Piper entitled Does a women [sic] submit to abuse? I must say I wasn’t quite as shocked as I thought I might be from some of the comments I had seen. I can accept that a woman who has committed herself to a man in marriage should endure some difficulties including minor abuse without walking out on him – and exactly the same for a man who has committed himself to his wife. I am not saying that either should endure life-threatening abuse, or submit to being required to sin, but then neither is Piper. If it’s not requiring her to sin but simply hurting her, then I think she endures verbal abuse for a season, and she endures perhaps being smacked one night, and then she seeks help from the church. Every time I deal with somebody in this I find the ultimate solution under God in the church, where the words “This man should be disciplined, this man should be disciplined” … She should have a safe place in the body of Christ where she goes and where the people in the church deal with it. She can’t deal with it by herself. These are good words in principle. The problem is, what if the abused woman does not feel safe in the church that she and her husband attend? What if, as Henry suggests, the abusive husband is himself one of the leaders of the church? This certainly happens. What if the church doesn’t believe her? This also certainly happens. What if the woman is so badly hurt that she cannot trust any man, and the church leadership is all male as Piper would expect? Does Piper mean to suggest that the woman should go to the leaders of a different church? That is not bad advice – I would hope that most churches would be prepared to help and protect a woman in those circumstances. The problem is that that church would have no authority over the husband to discipline him and bring about a proper resolution. And it would still cause serious issues if the husband is church leader well known in the area. Would the right thing for the woman be to report the matter to the authorities, as Henry suggests? In 1 Corinthians 6:1-8 Paul strongly warns believers not to take disputes between them to secular authorities. It would certainly be best if the church could deal with the matter internally, at least unless the case is so serious that the police would expect to be involved. If the church is unwilling or unable to resolve the matter, I think the abused woman would be right to look elsewhere for help. But that implies that the church is seriously failing to live up to its obligations towards its members. The wrath of God, or the inevitable consequences of sin? There are two things that I believe about wrath: that the phrase “the wrath of God” refers to something real but also that, as Julian of Norwich taught, “there is no wrath in God”. it is God who is active, who moves towards the sinners. So what is a properly Christian understanding of wrath? Wrath is when we experience the consequences of our own sin. Now I want to inject a word of caution here. In my post The Maltese Cross, or the Christian one? I argued against the position, which I consider sub-Christian, that “justice” is some higher authority than God which can oblige God to act against his character of love. Similarly I would reject any idea that “wrath” is a separate concept which imposes obligations on God. But Sam carefully avoids that danger by explaining that wrath, in the sense of experiencing the proper consequences of ones actions, is part of the consistent order of the universe which God created. If the governing idol is Mammon, then the scapegoated minority will be the poor, who will be described as deserving their poverty due to some moral failing, such as laziness. Wrath is first and foremost about when we go against the natural order and suffer as a consequence, but it is also about the nature of who we are as a human society when we are fallen. If we do not focus our human society on the Living God then we will end up having this process of scapegoating and sacrifice repeating itself for ever. that a loving God would never sentence human souls to eternal suffering. But Justin Taylor is wrong to conclude, without even reading Bell’s book , that this implies “full-blown hell-is-empty-everyone-gets-saved universalism”. It doesn’t. There are other real possibilities. One, with some biblical support, is that hell is populated by those who have chosen for themselves to go there. Another, and this would seem to be Sam’s position, is that people go there as the natural consequence of their sin. There is room for proper debate here, but not if some people prejudge others without even listening to them. Noël and I are rock solid in our commitment to each other, and there is no whiff of unfaithfulness on either side. But, as I told the elders, “rock solid” is not always an emotionally satisfying metaphor, especially to a woman. A rock is not the best image of a woman’s tender companion. In other words, the precious garden of my home needs tending. I want to say to Noël that she is precious to me in a way that, at this point in our 41-year pilgrimage, can be said best by stepping back for a season from virtually all public commitments. Personally, I view these months as a kind of relaunch of what I hope will be the most humble, happy, fruitful five years of our 35 years at Bethlehem and 46 years of marriage. In other words, reading between the lines, John and Noël Piper’s marriage was in trouble, not through any kind of unfaithfulness but because John’s heavy ministry workload, compounded by his international fame, was pulling him away from his wife and not allowing him to fulfil his role properly as “a woman’s tender companion”. These are the same kinds of strains which have ended Todd Bentley’s and Benny Hinn‘s marriages, to mention two high profile examples. I have my differences with John Piper on a number of issues. But on this one I am right with him. He has done what he apparently needed to do for the sake of his marriage. Would that others had done something similar before it was too late, before their marriage and potentially also their ministry was destroyed.